The Church of Cyprus (Greek: Ἐκκλησία τῆς Κύπρου, Ekklisía tîs Kýprou) is one of the autocephalous Churches that together form the communion of Orthodox Christianity. It is one of the oldest Eastern Orthodox autocephalous churches, achieving independence from the Patriarchate of Antioch and All the East in 431. The bishop of the ancient capital, Salamis (renamed Constantia by Emperor Constantius II), was constituted metropolitan by Emperor Zeno, with the title archbishop. The Apostle Paul, accompanied by Barnabas and Mark the Evangelist (Barnabas' kinsman), came to Cyprus in 45 AD to spread Christianity. Arriving at Salamis, they travelled across the island to Paphos, where Sergius Paulus was the first Roman official to convert to Christianity. In 50 AD St. Barnabas returned to Cyprus accompanied by St. Mark and set up his base in Salamis. He is considered to be the first Archbishop of Cyprus. Some Christians say Barnabas was stoned to death by the Jews on the outskirts of Salamis, where he was also buried. This independent position by ancient custom was recognized, against the claims of the Patriarch of Antioch, at the Council of Ephesus (431), and by an edict of the Roman Emperor Zeno. When the Archbishop of Antioch tried to abolish the Church of Cyprus' autocephaly, the Cypriot clergy denounced this before the Third Ecumenical Synod, which convened in 431 in Ephesos. The Synod ratified the autocephaly of the Church of Cyprus by its 8th canon. In 478, Archbishop Anthemios of Cyprus, following a vision, found the grave of St. Barnabas and his relics. On the saint's chest rested a copy of the Gospel of Matthew. The church was thus able to send a cogent argument on its own behalf to the Emperor: the discovery of the relics of its reputed founder, Barnabas. Zeno confirmed the status of the Church of Cyprus and granted its Archbishop the "three privileges": namely to sign his name in cinnabar, an ink made vermilion by the addition of the mineral cinnabar; to wear purple instead of black robes under his vestments; and to hold an imperial sceptre (i.e. a gilt staff of silver, topped by a gold globus cruciger) instead of the regular episcopal crosier. Cyprus suffered greatly from Arab invasions in the following centuries, and during the reign of Justinian II the cities of Salamis (Constantia), Kourion and Paphos were sacked. At the advice of the Emperor, the Archbishop fled to the Hellespont along with the survivors, and established the city of Nova Justiniana (Greek: Νέα Ιουστινιανή, Néa Iustinianē), named after the Emperor, at Artake near the city of Cyzicus. In 692 the Quinisext Council reconfirmed the status and privileges of the exiled Archbishop and in 698, when the Arabs were driven out of Cyprus, the Archbishop returned but retained the title of "Archbishop of Nova Justiniana and All Cyprus": a custom that, along with the "three privileges", continues to this day. After the establishment of Kingdom of Cyprus the Catholic kings gradually reduced the number of Orthodox bishops from 14 to 4 and forced those away from their towns. The archbishop was moved from Nicosia to the region of Solia, near Morphou, the bishop of Larnaca was moved to the village of Lefkara etc. Each Orthodox bishop was under the Catholic bishop of the area. The Catholic Church tried on occasion to coax the Orthodox bishops to make concessions on the differences in doctrine and practices between the two churches, sometimes with threats and sometimes using violence and torture, as in the case of the 13 monks in Kantara. Moreover, the properties of many monasteries were confiscated. The persecutions, especially during the Frankish period, did not succeed in uprooting the faith of the Orthodox Greek Cypriots. Despite initial frictions, the two churches gradually managed to co-exist side by side peacefully. The local Orthodox Christians shared some of the benefits of the economic development of Cyprus and especially Famagusta at the time. The Orthodox cathedral of St George (known as Saint George of the Greeks - today in ruins) is almost as high and monumental as the nearby Catholic cathedral of St Nicholas (a mosque since 1571), and is also an example of an interesting fusion of gothic and Byzantine architecture. John Hackett published "A history of the Orthodox Church of Cyprus" in 1901. At about the same time the church went through a crisis regarding the succession of the archbishop. The two candidates, Kyrillos II and Kyrillos III had mainly political differences (one was a nationalist whereas the other was a moderate). The destruction of Christian monuments was another important consequence. Churches containing Byzantine icons, frescoes and mosaics have been pillaged by antiquities dealers and sold on the black market. One of the most prominent cases of pillage was of the mosaics of Panayia of Kanakaria of the 6th century AD, which were finally returned to the Church of Cyprus, following a ruling by the Indianapolis Court. In Northern Cyprus, there are 514 churches, chapels and monasteries, many of which were converted to mosques, museums or abandoned. Metropolitan Chrysostomos of Paphos, 65, was elected the new archbishop on November 5, 2006, after a long-running election campaign, becoming Archbishop Chrysostomos II, Archbishop of Nea Justiniana and All Cyprus. 9 Byzantine churches in the Troödos mountains are listed by UNESCO as World Heritage sites, pictured here. ↑ Bachman, Carolyn (2003). "An Introduction to the Issue of Preserving Cultural Heritage". Brown Classical Journal. 15. Retrieved 19 January 2010. ↑ Bourloyannis, Christiane; Virginia Morris (January 1992). "Autocephalous Greek-Orthodox Church of Cyrprus v. Goldberg & Feldman Fine Arts, Inc.". The American Journal of International Law. 86 (1): 128–133. doi:10.2307/2203143. JSTOR 2203143. ↑ Morris, Chris (2002-01-18). 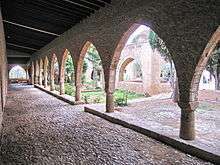 "Shame of Cyprus' looted churches". BBC. Retrieved 2007-01-29. ↑ Semi-autonomous part of the Russian Orthodox Church whose autonomy is not universally recognized.